Architecture students do some really wacky and innovative stuff. They stay up all night to get their work done and they build structures out of materials that are not normally used. 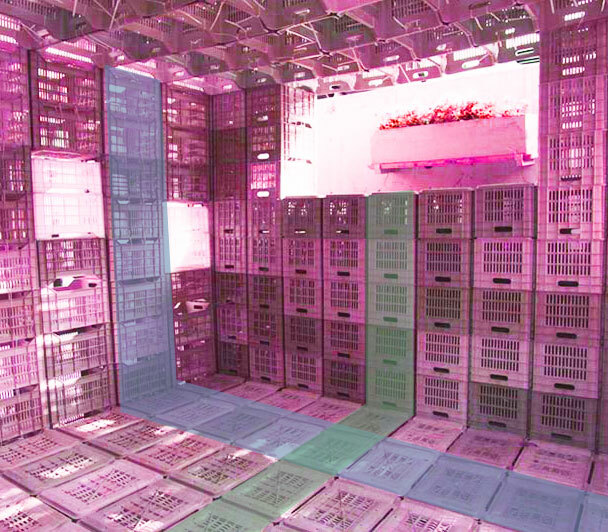 Like plastic vegetable crates. And plastic ties. And nothing else. 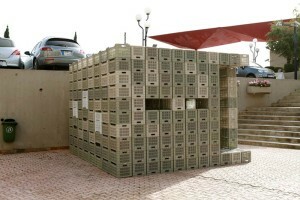 At Lebanese American University, in Byblos Lebanon, the architecture students were asked to solve a problem creatively. Due to massive numbers of immigrants, the students were asked to design temporary shelters. With plastic crates, they assembled these structures like simple building block boxes, removing some crates to make windows and doors, as well as tables and stools. With very little money spent on materials, they were able to define a space that a homeless family could call their own, with a bit of protection from the elements. Another advantage of this structure is that it could be built in a day. 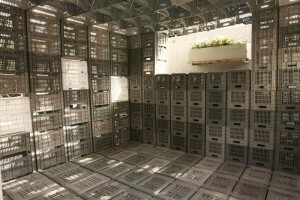 How many crates were used to build this structure in the photo? 416. How many people could this help? Thousands, perhaps millions. Studio Instructor: Richard Douzjian, Dr.Eng.